Thisstory was updated at 9:36 a.m. EST. NASA?sOrbiting Carbon Observatory (OCO), a new satellite dedicated to mapping Earth?scarbon dioxide levels, crashed into the ocean near Antarctica just after launch earlyTuesday when a shroud designed to protect the spacecraft accidentally doomedits mission. 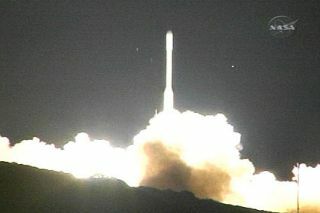 The glitchoccurred just minutes after the $273.4million spacecraft blasted off at 4:55 a.m. EST (0955 GMT) atop a TaurusXL rocket that launched from Vandenberg Air Force Base in California. ?Our wholeteam at a very personal level is disappointed in the events of this morning,?said John Brunschwyler, the Taurus project manager for the Dulles, Va.-based rocketmanufacturer Orbital Sciences, in a somber post-launch briefing. ?It?s veryhard.? The 972-pound(441-kg) OCO spacecraft was NASA?s first satellite built exclusively to mapcarbon dioxide levels on Earth and understand how humanity?s contribution ofthe greenhouse gas is affecting global climate change. The satellite carried asingle three-channel spectrometer to make its detailed measurements and wasslated to launch into a near-polar, sun-synchronousorbit that would fly about 438 miles (705 km) above Earth. Brunschwylersaid the first sign of trouble during today?s failed launch occurred about threeminutes after liftoff, when the Taurus XL rocket?s telemetry showed no sign ithad shed its clamshell-likepayload fairing. The fairingis a nose-mounted shroud that protects the spacecraft inside from the Earth?satmosphere until the booster reaches space. Once it separates, launchcontrollers expected to see OCO and its upper stage accelerate faster since itwould have shed the excess weight. But that speed boost never occurred. ?As adirect result of carrying that extra weight, we could not make orbit,?Brunschwyler said, adding that the failure ultimately sent OCO crashing intothe ocean near Antarctica. ?We?re fairly certain that it did not fly over anyland and it landed short of Antarctica.? NASA isassembling a mishap investigation board to investigate the failed launch and,agency officials hope, pinpoint a root cause. The investigation will be key forNASA?s Glory satellite, an environment-monitoring spacecraft also designed toaid climate change studies and slated to launch on a Taurus rocket in October. ?Our goalwill be to find a root cause of the problem,? said NASA launch director ChuckDovale. ?We won?t fly Glory until we have that data known to us.? NASA?s OCOspacecraft and its Taurus XL booster were built by Orbital Sciences. Thefour-stage solid fueled Taurus XL rocket stands about 93 feet (27 meters) talland is capable of launching satellites weighing up to 3,500pounds (1,590 kg) into low Earth orbit. The rocket is a land-based version ofOrbital Sciences? Pegasus booster. Sinceits 1994 debut, the Taurus rocket has flown six successful missions out of eightlaunches to orbit 12 satellites. The last Taurus launch reached spacesuccessfully in 2004. The one failure before Tuesday?s contingency occurredin September 2001. The loss ofNASA?s OCO spacecraft is a blow to global climate research after eight yearsof development to ready the satellite for launch. Researchershoped the spacecraft would provide definitive answers to questions surroundingEarth?s natural carbon dioxide cycle, as well as how the planet processes the 8billion tons of greenhouse gas produced by the burning of fossil fuels andother human endeavors each year. ?OCO was tomake some important measurements of the carbon cycle,? said Michael Freilich,director of NASA?s Earth Science Division. ?What we?re going to do is take a good,solid and thoughtful look at how best to advance earth system science in general,and with a focus on the carbon cycle, given all the assets that we have availablenow and into the near future.? Climate scientistsexpected OCO to take the lead in an international collection of weather-monitoringspacecraft known as the ?A-Train,? which fly in a train-like progression overEarth with the goal of building a three-dimensional picture of the planet?sweather and climate change, as well as understanding human contributions to thegreenhouse effect and global warming. Japan?srecently launched ?Ibuki?climate-studying spacecraft, as well as other satellites already in orbit, maybe able to compensate for the lack of OCO. While thereis hope to be able to pick up where the OCO?s loss left off, much work liesahead before NASA officials can ?decide how it is best scientifically, and forthe nation, to move forward,? Freilich said.